HODIE (Roman Calendar): ante diem septimum Kalendas Septembres. MYTHS and LEGENDS: The art image for today's legend shows Orpheus and the Animals, and there are more images here. 3-WORD MOTTOES: Today's 3-word verb-less motto is Nec devius unquam (English: Not ever swerving). ANIMAL PROVERBS: Today's animal proverb is Ex frixis ovis pullus numquam venit ullus (English: From fried eggs no chick ever comes... the Latin rhymes, too!). 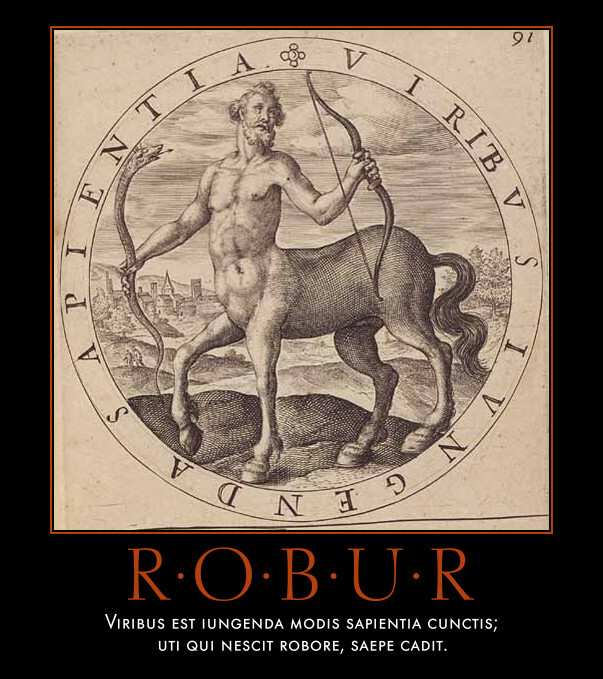 POLYDORUS: Today's proverb from Polydorus is: Conscientia mille testes (English: Your conscience is a thousand witnesses). 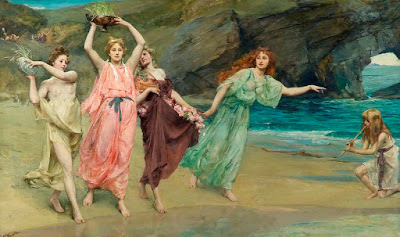 GREEK PROVERBS: Today's proverb is Μία χελιδὼν ἐὰρ οὐ ποιεῖ (English: One swallow does not make it springtime). BREVISSIMA: The distich poster for today is Quod Non Sumus Mancipia Corporis . Click here for a full-sized view. I see lofty things and pursue them. PHAEDRI FABULAE: The illustrated fable from Phaedrus for today is Soror et frater, one of Aesop's "family fables." Latin text and Smart's translation. STEINHOWEL: The illustrated fable from Steinhowel for today is De lupo et persona (although in the illustration, you see a statue, not a mask!). This is a story about a wolf in later Latin versions, although earlier versions feature a fox: Latin text and English versions. And here's a fun Latin LOLBaby: Fratrum concordia rara (blog post). HODIE (Roman Calendar): ante diem quartum decimum Kalendas Septembres. MYTHS and LEGENDS: The art image for today's legend shows Solon and Croesus, and there are more images here. TINY MOTTOES: Today's tiny motto is: Quaerere verum (English: To seek the truth). 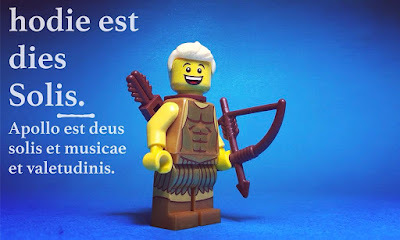 AUDIO PROVERBS: Today's audio Latin proverb is Non scholae sed vitae discimus (English: We learn, not for school, but for life). To read a brief essay about this proverb and to listen to the audio, visit the Latin Via Proverbs blog. ERASMUS' ANIMALS: Today's animal proverb from Erasmus is Annosa vulpes haud capitur laqueo (English: The old fox is not caught in the snare; from Adagia 1.10.17). 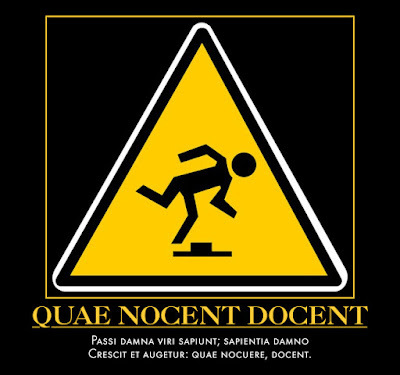 BREVISSIMA: The distich poster for today is Quae Nocent, Docent. Click here for a full-sized view. I laugh, therefore I am. PHAEDRI FABULAE: The illustrated fable from Phaedrus for today is Lupus ad canem, one of my all-time favorite fables: Latin text and Smart's translation. STEINHOWEL: The illustrated fable from Steinhowel for today is De Vulpe et Ciconia, a story about the trickster tricked: Latin text and English versions. HODIE (Roman Calendar): Nonae Augustae, the Nones of August! MYTHS and LEGENDS: The art image for today's legend shows The Labyrinth, and there are more images here. 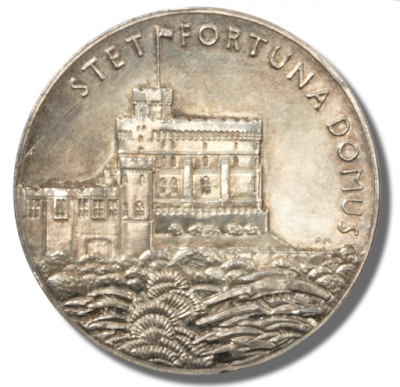 3-WORD MOTTOES: Today's 3-word motto is Meliora spero sequorque (English: I hope for and pursue better things). 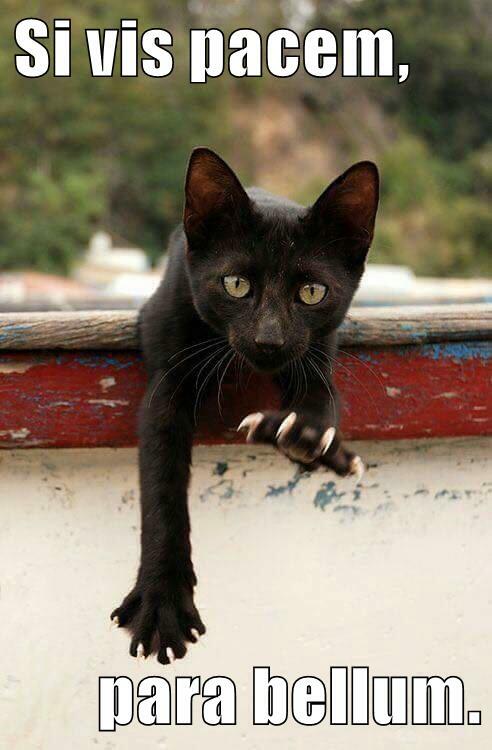 RHYMING PROVERBS: Today's proverb with rhyme is: Mortis linque metus, si tu vis vivere laetus (English: Put aside any fears of death, if you want to live happily). VULGATE VERSES: Today's verse is Nemo propheta acceptus est in patria sua (Luke 4:24). For a translation, check out the polyglot Bible, in English, Hebrew, Latin and Greek, at the Sacred Texts Archive online. 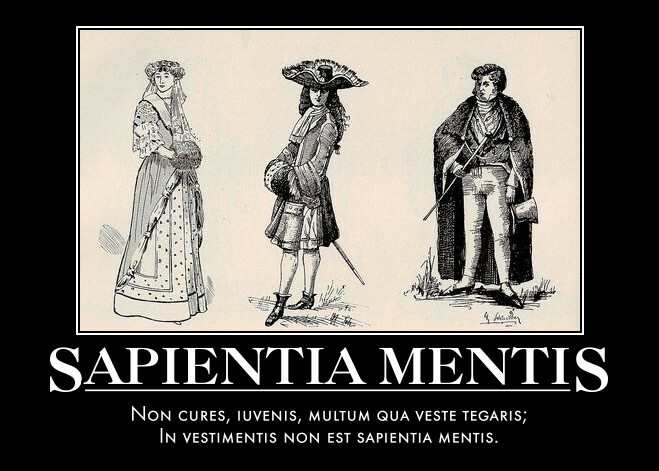 BREVISSIMA: The distich poster for today is Sapientia Mentis. Click here for a full-sized view. Love alone does not sin. 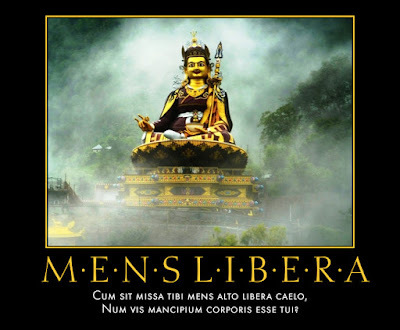 Ebibe vas totum, si vis cognoscere potum. Drink the whole glass, if you want to know the drink. PHAEDRI FABULAE: The illustrated fable from Phaedrus for today is Aesopus et petulans, a story about how dangerous the trickster Aesop could be: Latin text and Smart's translation. STEINHOWEL: The illustrated fable from Steinhowel for today is De cervo, ove et lupo, a story about injustice: Latin text and English versions.